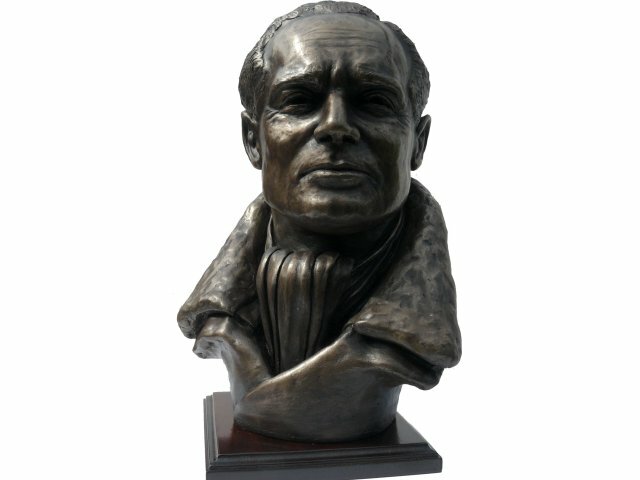 Douglas Bader was one of the legendary Names of WW2. His bravery and determination have provided an inspiration to many over the years. In 1931 Bader lost both his legs in an aircraft crash attempting some low-flying aerobatics. Bader made the following laconic entry in his logbook after the crash "Crashed slow-rolling near ground. Bad show" After months of painful recuperation learning to walk on artificial legs Bader undertook refresher training, passed his check flight and was found fit for active service. However he was retired from the RAF in 1933 for medical reasons. Bader returned to the RAF at the outbreak of World War II - Posted to a fighter squadron in 1940 Bader scored his first kills during the Battle of France over Dunkirk. 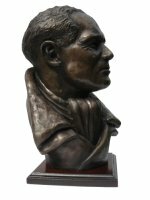 He quickly rose to the rank of Wing Commander and with Trafford Leigh-Mallory instigated the "Big Wing" tactical formation. Forced to bale out during a fighter sweep over France in 1941 Bader spent the rest of the Second World War as a prisoner of war. His repeated escape attempts led to his eventual incarceration in Colditz Castle. 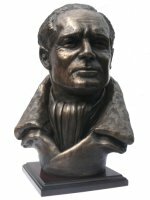 Group Captain Sir Douglas Bader a truly inspirational British hero. 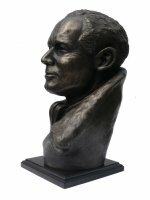 This cold cast Bronze Douglas Bader Bust is made entirely by hand by sculptor Peter Close in his studio in Somerset. 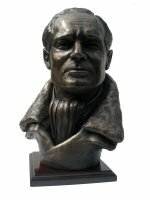 Each limited edition Douglas Bader sculpture is hand engraved by Peter with its own unique edition number and will come to you with a signed certificate of authenticity.